The change from fall to winter in Fountain is one that often happens overnight. A lovely, warm fall day can be followed by a snowstorm without much warning. Warm weather followed by snow, followed again by the sun melting the snow… Colorado drivers should be prepared for anything as soon as the calendar moves from summer to autumn. Fluctuating temperatures can alter the amount of air in your tires. Grab a pressure gage and take a moment this month to make sure all four tires are filled to the recommended pounds per square inch (PSI). Maintaining the correct tire pressure ensures better fuel efficiency and reduces the likelihood of a flat tire. While you’re walking around to each of your car’s tires, go ahead and check how worn the tread looks too. While it’s true that tread with a height of 2/32 of an inch is the lowest acceptable measurement, driving in wet weather requires more tread to stay safe. Rain and snow require a minimum of 4/32. 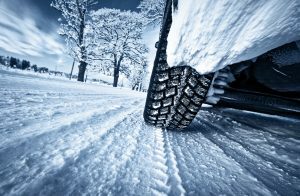 Make sure your tires are free of any obvious bulges or bald spots – these could cause you to lose control of your car when driving on slippery roads. Don’t wait until you’re driving in a downpour to notice that you could use new windshield wipers. This needlessly puts your life and the lives of other drivers in danger. Try to make a habit of cleaning your windshield regularly. While stopped at a red light, take a moment to spray your windshield with cleaner and notice how your wipers perform. If they miss spots or seem to struggle in any way, replace them. Another crucial system for safe winter driving? Your defroster. Nothing is scarier than fogging up unexpectedly and losing sight of the lanes on the interstate. Be sure to test it occasionally, making sure that the air flow is strong and it works quickly to restore your ability to see clearly from all windows. Cold weather is hard on car batteries, especially if they’re older. You may notice that your car takes an extra beat to crank on the chillier mornings. If you notice this as fall and winter approach, or even before you do, it’s a good idea to test the voltage output of your battery with a multimeter. If you don’t have one, you can drive by an auto-repair shop and have a technician test for you. Make sure your battery can handle all conditions and hold a charge in any weather. During fall and winter, your brakes will be tested by challenging driving conditions. Once the slick, icy roads are here, you’ll want to know your brakes are functioning as well as they can be. Using your brakes every day wears them down, so be sure and have them inspected frequently. If your brakes are squeaking at you, that’s a sign they are asking for some attention. Make sure that your coolant (or antifreeze) has been flushed before the weather gets too cold. It is a crucial component of keeping your car running at a safe temperature. It’s best to have coolant flushed in the fall. A bad time to realize that you took the ice scraper out of the car is just after a surprise fall snowstorm drops six inches of snow on your car while you’re at work. It’s back at home in the garage, where it’s been since spring. Remind yourself to throw in into your trunk when you get home, so you’re prepared for that first storm. While you’re at it, you may as well put together a few auto-survival essentials (blankets, flashlight, water, etc.) to keep in your trunk. The bottom line is that listening to your car and paying attention to what it’s telling you is critical for safe fall and winter driving. Small problems tend to reveal themselves, or grow into bigger problems, as the weather turns. Stay on top of scheduled maintenance and inspections and handle any issues that come up now – give us a call at 719-382-5691 if you have any questions!